Last year, we began working with our clients who were undergoing a major renovation to their home. The renovation was a thoughtful reworking of the existing space with the only addition to the house's footprint being the new screened-in porch. The entire floorplan of the first floor was reworked and my clients created a massive open kitchen with an attached dining room and entry out of what once was the kitchen, dining room, living room and entry. The wife likes bold fresh colors & has slightly modern taste while the husband is pretty traditional so we were really after a blending of the two. Like me, my client loves botanicals & we couldn't resist these two massive ones by Natural Curiosities. I flanked them with large bright green lamps to balance out their size. The trestle table is paired with lighter carved chairs and I love the detail on the seat backs. We found the neutral Greek key rug at Stark. On the table, I used modern garden cloches on the table filled with ferns and orchids. It looks like slate but was super-inexpensive. 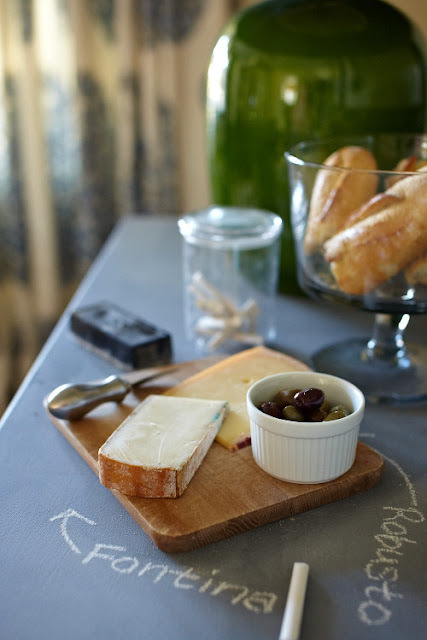 (I know, I know, chalkboard is EVERYWHERE... but I still love it in enexpected places!!) We had planned to use honed granite or concrete & I'm so happy she did this instead!!! It's so convenient now to label food & drinks set out on the bar. 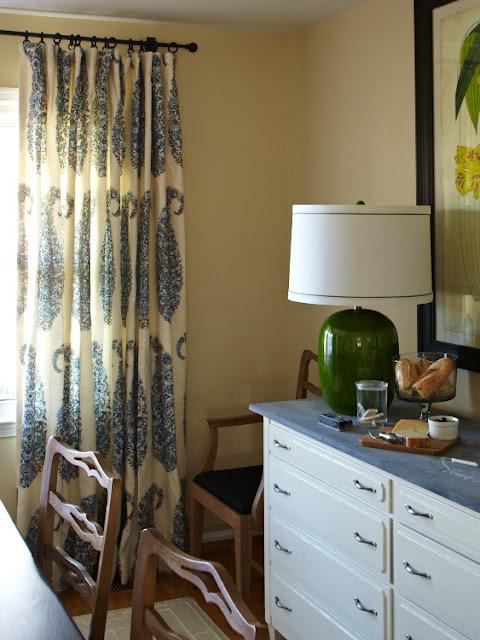 For curtains, we used an overscale blue paisley by Schumacher and throughout the house we used a combination of bright blues & greens. This project was particularly special for us to work on for a number of reasons and the "big reveal" had me teary... I want to thank my clients so much for letting us into your home & your lives. I'm off for the day- am having contractions and am heading in to doc to check it out & am doubting this is "it" but they make you come in anyway so we'll see. I'll keep you posted!! Beautiful! And Best Wishes for an easy delivery and healthy baby, Mom! You are the ultimate multi-tasker. Blogging and being in labor (maybe) :) I love the dining room, Lauren. The botanicals are amazing! AMAZING. Love the chandelier/botanicals/lamp combo, really stunning. Great job! OMG, totally swooning over this makeover! Love the green and I have one of those chairs! Blogging and having contractions, you are good! LOVE everything about this room. I just have to know where that chandelier is from?!?! I love how changing the use of of black, white and wood tones ups the sophistication of this room. I am still so in love with chalkboard paint, too! Looks beautiful! Green's my favorite color so I could definitely have something like this in my house. 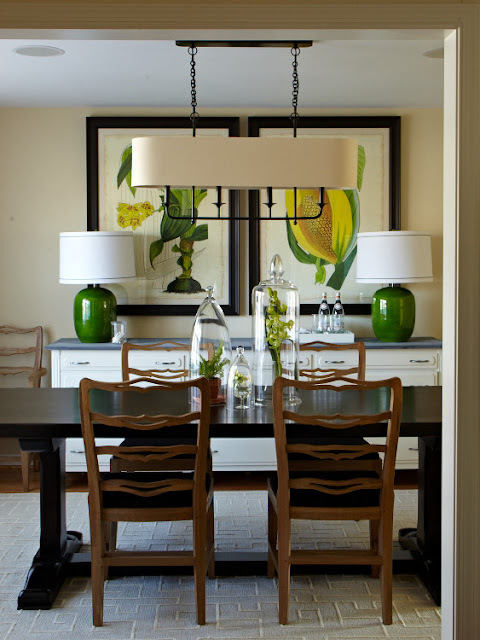 I love the light fixture over the table as well! Great pics, Lauren. I once considered that chandelier for our dining room, and I thought I had crossed it off the list, but AHHH, I don't know now! It looks fantastic in that dining room. And keep running....those contractions won't stop and you can be done (jk). Beautiful. Such a striking modern/traditional combination. So glad you got it done before the baby! Beautiful! Love your color choices and the drapes! Very nice idea with the chalkboard! Best wishes for you and baby! I love the space. Your really revitalized it! The Schumacher drames are gorgeous. I love it all. This is fantastic Lauren, I absolutely love the dining room, and pops of intense green! Brilliant lighting and overall design! Omgosh, bless your heart, contractions, blogging, taking care of little ones and home, Amazing, that is what YOU are!! The chandelier is fantastic! It is something I was looking for. Of course you're having contractions and blogging. You're hilarious Lauren! Love the dining room and the bold prints and colors. As always..fantastic job! Amazing amazing amazing room. Everything compliments so well without being too matched up. Love it. Good luck with the contractions! Gorgeous! And chalkboard paint!? Who knew. Good luck today! That is a really beautiful room! Love the blues and greens, and the way you merged the couple's styles. I squealed with excitement when I saw MY dining room chairs used in this room! I bought four of the same at an estate sale a couple of months ago, and just love them. Great job, and good luck at the doc! The chalkboard paint on the top of the sideboard is genius, I love that idea!! This dining room is absolutely gorgeous! I want it! love this room...everything about it. Lovely! What is the wall color? Loving the before and afters of this dining room. Feels very fresh and relaxing! What is the color of chalkboard paint? It doesn't look like a traditional black. Certain brand? I actually gasped when I saw the AFTER photo! I adore the huge art and lamps. Such a difference. Thanks for the inspiration. I mean - WOW! Love the before and after - you made it a completely different space. I'm sure they're going to have many happy meals here. It's a very friendly room. Lauren, I love this room!! Perfection. Get some rest. You are so talented and a super baby mama! The room makeover is beautiful Lauren. I love the botanicals and the chalkboard treatment is wonderful, love the lamps and the drapery fabric too! Best wishes for a very smooth delivery. I love the dining room and you balanced everything out beautifully. Looks like you were able to make everyone happy with that room. Love this Lauren! You are a smart cookie and one talented designer! Love using the chalkboard on the top of the piece, genius! You are so talented....that room is gorgeous! Thinking of you as you are close to childbirth...God bless! This is one of the prettiest dining rooms ever! I love the botanical prints and the green lamps. Also, love your clever centerpiece. Can't wait to hear about the new baby!!! there is nothing quite like a before and after - and this one is stunning. Congrats on a gorgeous job. The lamps and the prints on the wall are totally the focal for me ...beautiful. Gorgeous, Lauren! I love it all, but those oversized botanicals are to die for!!! So excited about the upcoming arrival of Adorable Liess Baby #3!!! Absolutely loving the transformation Lauren!! The green of the lamps and botanicals is gorgeous. "Max is awesome" Then Max is crossed out and "Alex" is written above it. you have such a sense of style lauren that i am recognizing your rooms and think i could pick them out in a line up. all meant in a really good way. each room of yours has such depth, texture and color used magnificently! really adore your style. well wishes sent your way for an easy peasey delivery! WOW! This looks so beautiful!!! I love it! I hope that you are feeling good, wishes and prayers for an easy delivery. Lauren- The sense of scale in the new dining room is right on - it practically sings! They must be thrilled. Best wishes with those doctors visits - you never know! Gorgeous and Green! I love this. Congratulations on your baby whenever he/she arrives! WONDERFUL job! And you have inspired me for a new client I hope to get! Iam sending all my best wishes for your new family member!!!! this is soooo gorgeous!! Great job Lauren! I am super sure your clients are very, very happy! Amazing! Great job. I am so in love with chalk board paint right now. What a great idea. Never ever underestimate the power of a pregnant woman! You and your nesting instincts must be in full mode....Let us know when the baby arrives in your nest...chirp chirp! Lauren, all your designs are so beautiful and this gorgeous dining room is no exception. The design is really nice! Simple yet classy! I am using that chandelier in a law office conference room...great to see it hanging. Love the room...time for a dinner party! LOVE the room. Where is the gorgeous lamp from? I love the balance of light and dark and the large scale items to give the room that little zing. Love your stuff! Good luck with this delivery! This dining room is beautiful, Lauren. I love the large botanicals that are framed, and the chalkboard top of the sideboard is so great. Love that they can write on it with their different offerings for guests. I love this room! May I ask the color or brand of chalkboard paint that you used?